Experience the ATD CloudConnect™ Advantage. Take advantage of ATD’s state-of-the-art functionality. Imagine an integrated phone system that can perform the same functionality for your business needs as your smartphone does for your personal needs. INSTANT MESSAGING – Looking for the answer to a quick question, or busy on the phone? Get what you need with a simple chat to your colleagues. 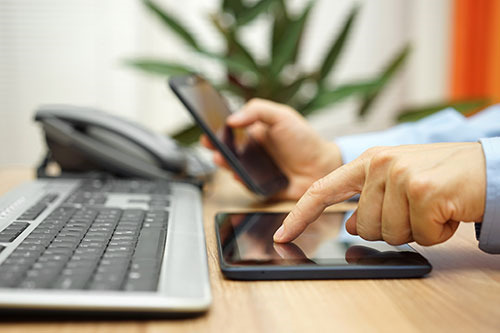 SOFTPHONE – Workers enjoy the same intuitive communications management they would experience in the office from a remote PC or laptop with an embedded software-based IP phone. 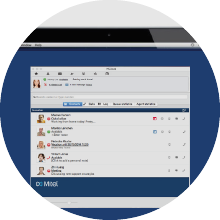 CONFERENCING – Schedule a conference call and invite your colleagues and/or customer directly from your desktop or mobile app. 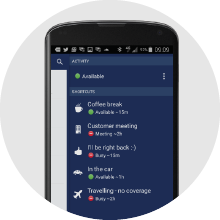 EXCHANGE CALENDAR INTEGRATION – Easily synchronize your presence information from the exchange calendar to alert others to your availability. SMS – Enable text messages to be sent from a user’s computer using the web interface or from the desktop or mobile app. Messages can be sent from personal numbers as well as group numbers. WEB ACCESS – Get access to key collaboration features from remote locations using any computer with Internet access. 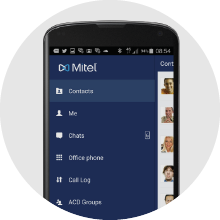 SINGLE NUMBER REACH – Allow users to be reached on any device through a single phone number with intelligent call routing capabilities. Your personal cell number stays personal. Calling the single number rings one, some, or all devices simultaneously depending on user preference and defined rules. Know when colleagues are available, away from their desk, or out of the office and choose the best mode to reach them. Check voicemails, fax, and call recording services directly from the desktop or mobile app and have the audio files emailed to you. The cost benefits of a cloud-based solution are quite impressive considering the ability to have the same functionality outside the office as within the office.